An old photograph has helped solve a mystery which had been blocking plans for a new concert hall. It has revealed the location of the grave of legendary England cricketer Fuller Pilch in a churchyard in Kent. Canterbury Christ Church University bought the graveyard in 1981 and wants to build an £8m concert hall there once the 200 remains are reinterred. Pilch's memorial was moved to the county cricket ground in 1978 so they had been unable to locate his plot. Peter Pilch, 78, a distant relative from Wadhurst, East Sussex, remembered a picture of his mother Doris standing beside the grave in the 1950s and found it in a family album. 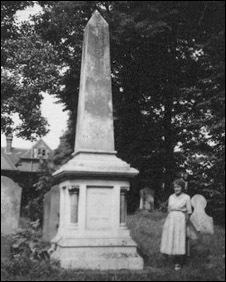 The photograph was taken before the memorial was moved and provided enough information for the grave to be pinpointed. "This was very helpful for us," university spokeswoman Claire Draper told BBC News. "Fuller Pilch's grave is near the front entrance to the church and our development is to be built at the back, so the grave won't be disturbed," she said. She added that two other local residents had also come forward to help locate the grave. Twin sisters Jacqui Shipton and Donna Sayer, now 49, remembered playing in the graveyard as children and recalled the location, she said. She said the university may also consider some way of marking the cricketer's grave so that the location remains in the public domain. The talented sportsman played for Kent from 1835 to 1854 and became famous for his unusual batting technique, which became known around the country as the Pilch Poke. He was described as England's greatest batsman until the arrival of WG Grace. During his career he played for Norfolk, Leicester and Kent and also represented England. The plans for the university's new concert hall will be presented to Canterbury City Council for consideration on 22 July.